An old legend has it that a rich emperor carried this box with his most valuable possessions locked inside when traveling to combative territories. No one could open the box to steal his treasures without knowledge of the secret. 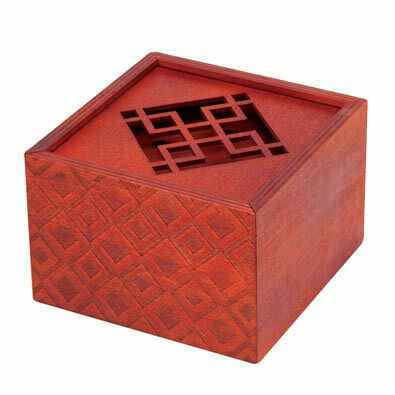 This elegant wooden box has a geometric laser cut design on the top and patterns on two sides. Made of pine and finished with a rich mahogany stain. Measures 4-3/8" x 4-3/8" x 2-15/16". Solution included.